On Tuesday the 1st of May, two TY groups attended an award ceremony for the RTE All Ireland Drama Festival Schools Playwright Competition. Congratulations to Sarah Cox and Edel Clabby whose scripts were shortlisted. They won two tickets to a show in the Dean Crowe Theatre, Athlone. Thanks to Ms. Quinn and Ms. Flannery who went with the groups. Well done to Zoe Guinane, Olivia Hoysted, Francesca McGreal, Shauna Gilbride and Rebecca Gill who helped out at Bridgeway’s and Lucy Anne Myhill, Niamh Dempsey, Brian Casey, Dylan Coady, Bryn Peters, Gordon Farrell and Ellen Shannon who helped at the day-care during the week. On Thursday the 3rd of Maythe Ty’s had their annual Sponsored “lock in” in the school’s gym. All money collected goes to the homeless shelters in Longford, Bethany House and St. Martha's. Our four school Digital champions, Katie Gouldsbury, Mateusz Bednarek, Tami Dania and Liadhan Farrell enjoyed their tour to google headquarters in Dublin with Mr. Dempsey on Thursday last. There was a bake sale held on Wednesday 25th April in aid of St. Luke’s Hospital. It was organised by a group of ty girls who plan to take part in the ladies mini marathon in Dublin on Sunday June the 3rd and the seven Ty boys who have volunteered to help at the marathon. 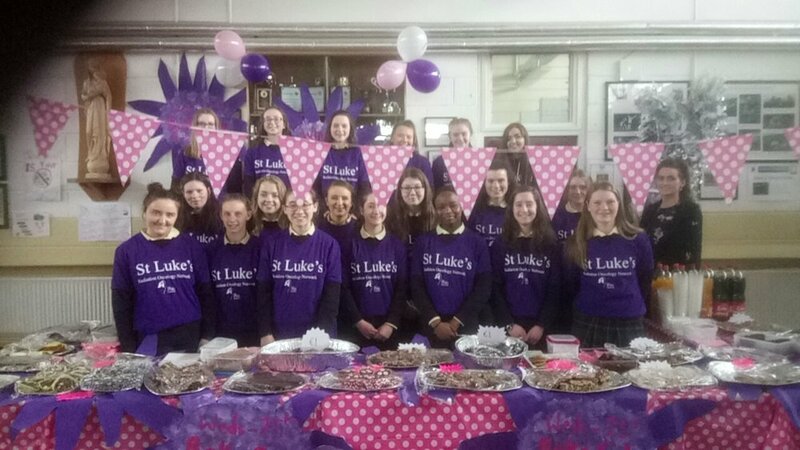 Together with the first years contribution to their guest speaker from St Luke’s on Friday morning and other kind donations from the public they have raised a staggering €1,022.00 which is all going towards St. Luke’s cancer hospital. The VHI Women's Mini Marathon main sponsor Today FM have chosen to work with our school this year and are going to make a clip of the different events held in our school as the students prepare to undertake this challenge. This clip will be put up on their social media accounts so that others can donate to the Charity. This clip will also be used at the start line of the run to get the thousands of us geared up for the 10km to be completed. Big thanks to Mr. Walsh, Mr. Carr, Mr. McCormack and Ms. Quinn who helped the TY students with their guest speaker and warm up for the Today FM crew. Mercy Ballymahon’s first year girls’ basketball team qualified for the All-Ireland playoffs in the University of Limerick on the 28th and 29th of April having won 6 of their 7 games in the Regional Competition. Parents, players, coaches and supporters made the journey to the sports arena in UL for a Competition which pitted Mercy Ballymahon against Loreto Letterkenny, Regina Mundi College and Clonaslee College. Congratulations to the 1st year girls’ basketball team who, at the end of a long campaign, can say that they are deservedly one of the top eight teams in the country. Thanks to coaches Mr. Walsh and Ms. Carr for all their work with the team. We would like to thank all players, parents and Ms. Donohue for making it a memorable and successful weekend. Thanks to the PE teachers Ms. Carr and Mr. McCormack who taught all their students CPR during their PE classes last week. Well done to the u14 girls football team who beat St. Marys Edenderry in the Leinster Quarter final and now play Bunclody in the final. Thanks to their coaches Ms. McTiernan and Mr. Seery. Last week was active schools week. Throughout the week students were informed on the importance of healthy eating and an active lifestyle. A simple exercise routine was called over the intercom and lasted for ten minutes each day. All students and staff were encouraged to participate. The 2nd and 5th years had a basketball tournament. The sixth years played the teachers in a volleyball game. There was an Art Competition held among 1st years to design a “Mercy Ballymahon Get Active” Logo and Slogan. Eleven of our teachers took part in staff golf outing on Friday 27th at Newforest Golf club, Tyrellspass. Congratulations to Ms. Donohue, Mr. Dromey and Mr. O Gara who won the tournament. Mr. Walsh got the closest pin and Mr. Bohan got the longest drive. Our LCVP students completed their exam on Wednesday the 2nd of May. Thanks to Moate business college who spoke to the leaving cert students last Thursday re post leaving cert courses available at their college in September next.